If you get a text from your teenager in the middle of the school day, something’s wrong. It might be something minor, like a paper forgotten on the printer at home or gym clothes left sitting in the back hall, with a request to deliver them to the office if possible. It might be more serious, like a warning to expect a call from a teacher about a poor grade or a behavioral misstep. On Monday, my son texted after third hour to say the sore throat he had been feeling earlier was getting worse. Could he come home? 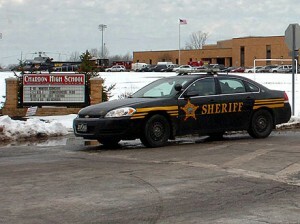 On Monday in a small town 30 miles east of Cleveland, students at Chardon High School sent panicked text messages to their parents filled with fear and confusion. A shooter had opened fire in the school cafeteria, apparently targeting a table of students who were eating breakfast while waiting for the bus to their vocational training campus. Before the day was over, two students were dead, three were in serious to stable condition, and a community was changed forever. In the aftermath of Monday’s inexplicable tragedy, there are far more questions than answers. The families of Daniel Parmertor and Russell King Jr., the two students fatally shot in the melee, are likely too stunned to seek out reasons for their sons’ murders. As if any explanation could make sense of them. According to reports, the family of alleged shooter T.J. Lane is equally confused. In a statement released on family members’ behalf, they are said to be grieving along with the victims’ families and the entire community over a calamity they never anticipated, never saw coming. Disconcertingly, though, the media on Monday was quick to label T.J. a “bullied outcast,” as if framing the narrative for a story that would suppose the shooter to have been pushed to the edge of his emotional limits by heartless and insensitive peers. After all, in a nation where, according to a Josephson Institute of Ethics survey of 43,000 teenagers, fully half of all teens admit they have bullied someone in the past and 47 percent report they have been the victim of bullying, it’s likely that a history of bullying could have played a role in the emotional state of the perpetrator in this case. Students interviewed for media reports in the aftermath of the incident indicated T.J. was quiet and may have been considered an “outcast” but was not bullied. An attorney for his family said the young man kept to himself but had friends and was never in any trouble the family knew about. To be sure, bullying represents a serious societal issue, not only because of the harm done to young people during their vulnerable, formative years, but crucially, because it reflects a crisis in character among our youngest generation. Too many of our nation’s children don’t get that bullying – for whatever reason – is always wrong. But we would be wise not to allow the label of “bullied outcast” to explain away what appears to be a more complicated and potentially dangerous explanation for this week’s tragedy in Ohio. The harder yet more damning truth may be that children in this culture cannot escape the relentless messages of immorality that permeate the culture in which they live. Despite the best efforts of parents and families, schools and communities, the media-saturated existence of our youth – filled as it is with violence and vulgarity, evil and insanity – is defining too many of our children and presenting them with horrific examples of human behavior. It’s a school cafeteria on a Monday morning in Chardon, Ohio. And it’s thousands of text messages from terrified teenagers alerting their parents – and all parents – that something is terribly wrong.